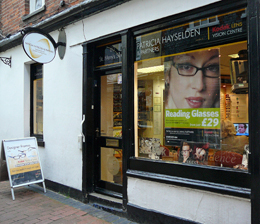 Patricia Hayselden & Partners is a long-standing practice (formerly L Hubbard Opticians), with an excellent local reputation and friendly staff who are committed to finding the right solutions for people’s visual problems. Most of our patients come to us by personal recommendation. In addition to our fully qualified and accredited optometric staff, we have qualified dispensers, registered with the General Optical Council, in all our locations. Our investment in qualified, experienced and educated staff means that you can be confident of our standard of service and of a result that is both professional and just right for you.